CHARLESTOWN, Nevis – The following is a statement from the Honourable Vance Amory, premier of Nevis and minister responsible for the Nevis Disaster Management Department (NDMO), dated Sept. 4, on the impending passage of Hurricane Irma. It is incumbent on me to report that we are likely to have the effects of Hurricane Irma within the next two days. Today, I convened a meeting with the Nevis Disaster Management Department (NDMD) and all of the heads of departments in Nevis, with respect to our preparedness to face the impact of Irma should that storm hit us. Indications are that Irma, on its present course, could have an effect on Nevis by Tuesday night or early Wednesday morning, Sept. 6. In that regard, we met today to determine the level of preparedness with every single department – health, fire services, police, public works, agriculture, education and so on – and it is clear that all of the heads of department have been very keen on ensuring that the preparation and preparatory work has been done. However, it is my duty to advise every single citizen, every single householder, that you have a responsibility to secure your premises to ensure that your loss is minimised, if that ever occurs. It is also important that you take care of your animals and your other movable property. Secure them so that they can be safe in case of a strike from Hurricane Irma. 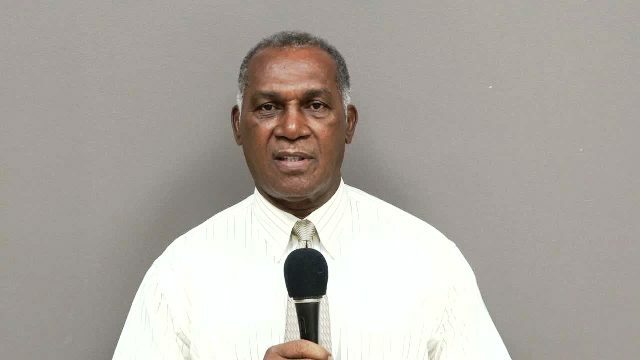 The Public Works and Nevis Water Department will make a specific statement with respect of their services, as will the Nevis Electricity Company Limited (NEVLEC), but I would ask you, all of you, to take first of all precautions to make sure that you are safe; that your family is safe; that your property and your belongings are safe. You have heard [during] the last few weeks all of the advice in terms of how to protect your property and your premises and I will only now say to you that you have that responsibility, but we as government have ensured that our staff have made and taken the necessary actions so that we are in a state of preparedness in case there is [a] hurricane strike. Last of all, let us note that Hurricane Irma has the potential to be a Category 4. A Category 4 hurricane is one [that] can do extensive damage to any [unsecured] surface. My advice therefore to you is let us take precautions and do it now. We have one day and a half in which to prepare. Let us do so now. You will also note that we have suspended school for our children so that they can be safe in case there is any sudden change in the weather pattern. However, we will make a statement with respect of our public servants by this evening if we think it is warranted, but certainly by Tuesday afternoon we expect that all preparations will be completed and that we would make sure that we have done the best we can. Pray that God will protect us from the ravages of Hurricane Irma. Thank you. God bless you and let us seek to be safe.